Bing has announced it is to give its users a more entertaining experience, adding extra functionality to its search. As of this week, those using the decision engine can now go to www.bing.com/entertainment and search for songs and movies and get extra information. 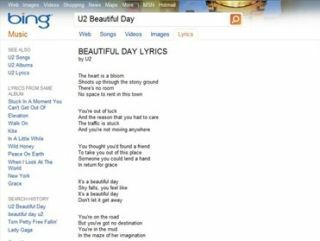 For example, if you type in your favourite song, then Bing will bring up the lyrics and more facts about the band. If you are looking to do a spot of online gaming, then Bing will allow access to the game from its search page. Speaking about Bing Entertainment, Yusuf Mehdi, Senior Vice President, Bing, said: "As the content on the web has exploded, it has become difficult to navigate and find what you are looking for. "In the field of entertainment, 76 percent of people use search to help find and navigate their entertainment options online, but only 10 percent say they have a trusted place to go. "So we see a great opportunity to help customers make important entertainment decisions – from deciding what movie to buy or see, which TV shows to watch online or on your TV, what music to listen to, how to find and safely play your favourite casual games – Bing is making a first step today to help make entertainment on the web easy and fun, so you spend less time searching for entertainment and more time doing the stuff you love." Some of this functionality is available already but the rollout is expected to happen over the next few weeks.